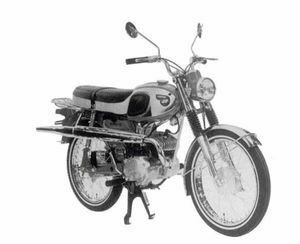 The Kawasaki D1 was 100cc single cylinder street motorcycle manufactured by Kawasaki in 1966 through 1969. that was virtually a bored out Kawasaki J1T. Developing 10bhp at 7000 rpm, it was almost identical to the J1T, right down to the whitewall tires and upswept exhaust pipe. Production ran until 1968. With an elevated exhaust system it could pull slight off-road duty. It was replaced by the Kawasaki G1. Remarks: Developed version of the G 1. White line around the tires.